From dirt to street, and everything in between, Yamaha has plenty of awesome motorcycles to choose from on the showroom floor. 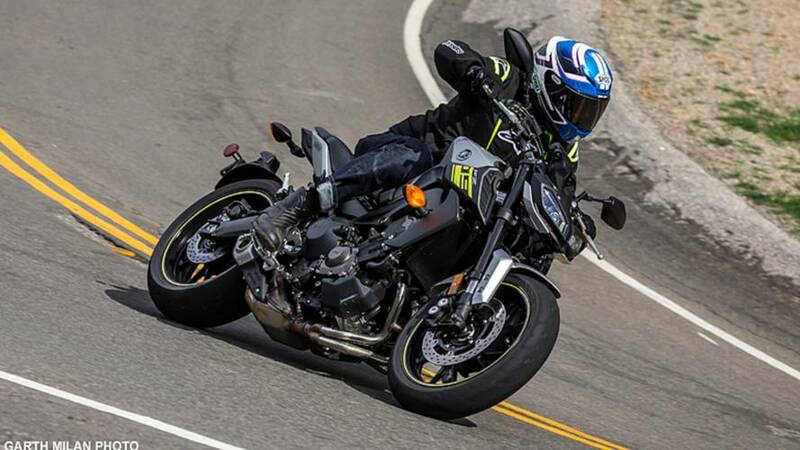 But when it comes to bang for the buck in the road bike segment, you won’t find a much better value than the new and improved FZ-09. For 2017 it’s received some significant improvements that are worth far beyond its $1000 price increase that has bumped MSRP to $8999. Starting with the heartbeat of this naked sports bike, the liquid-cooled 847cc CP3 Inline Three is one of the most fun, friendly, and versatile engine configurations on the road. While the Brits were first to harness this configuration a decade ago, it’s the Japanese who’ve mastered the design. From the moment you press the starter button, to when the kickstand drops, it should be criminal how fun this Triple is to wield on the road. Torque, and lots of it, is the trademark feature of this powerplant. Crack the throttle and zip past anyone next to you. Power is immediate and there’s so much of it the bike wheelies on command in the lower gears. 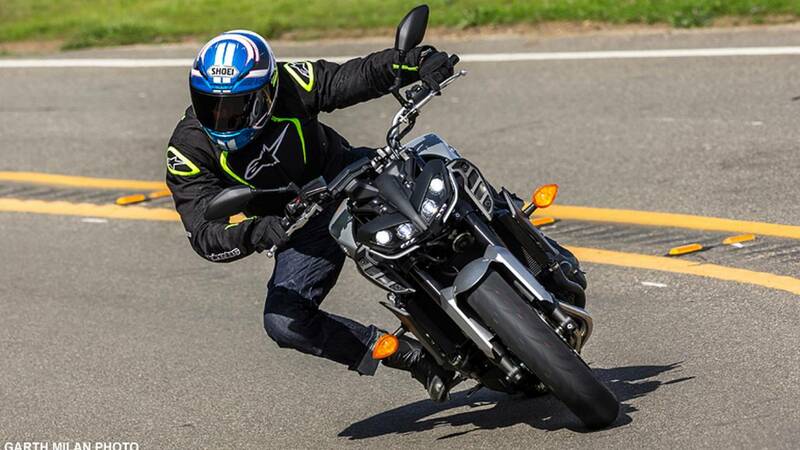 Two-way adjustable traction control (Yamaha calls it TCS) trickles down from the XSR900, helping to keep the wheel attached to the ground, whether you’re riding on wet or dirty gravel strewn roads. Mode 2 is the more intrusive setting—ideal for rain riding, while Mode 1 is more apt for sport riding on your favorite twisties. It can also be disabled, if you so choose, via a few pushes of the switchgear button as long as the motorcycle is stopped. On the road the electronics perform so well, there’s no reason to turn them off, unless you want to stunt for babes and hang huge stand-up wheels down the boulevard. That’s cool, right? A simple yet effective all-digital dash is front and center and is loaded with all the information needed to make for a fun and mindful ride. The fuel mileage calculator is especially handy, because it helps you keep tabs on what’s remaining in the 3.7-gallon fuel tank. Gear shifts between each of the six cogs are both smooth and seamless feeling. 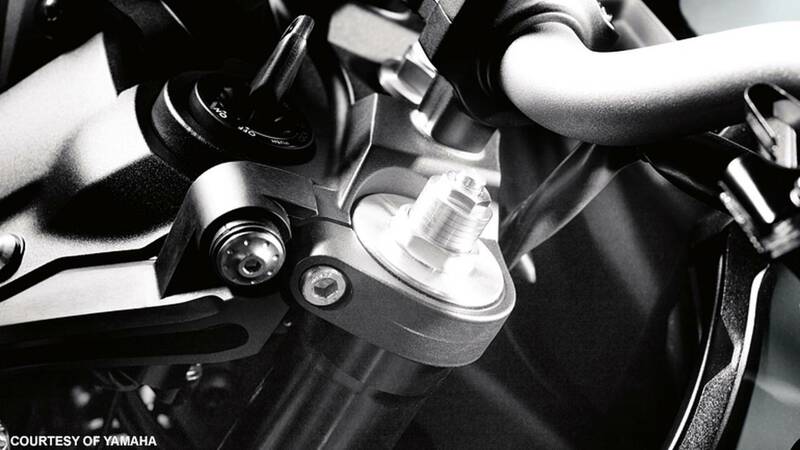 If the manual setup is too slow for your tastes, Yamaha offers an accessory quick shifter kit ($159.99) thereby enabling instant and fully clutch-less upshifts. Speaking of the clutch, that’s been updated too. 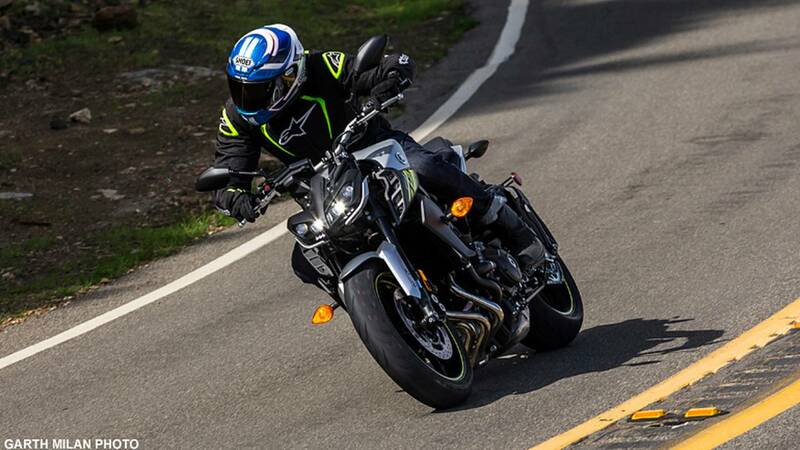 The new FZ-09 benefits from the Tuning Fork brand’s mechanical slipper action design that prevents the back tire from chattering if you downshift in too low of a gear for the speed you're traveling. As an added plus, the design reduces clutch lever pull and associated clutch hand fatigue. The riding position has been tweaked slightly too, with a longer seat giving the passenger a scant more room. 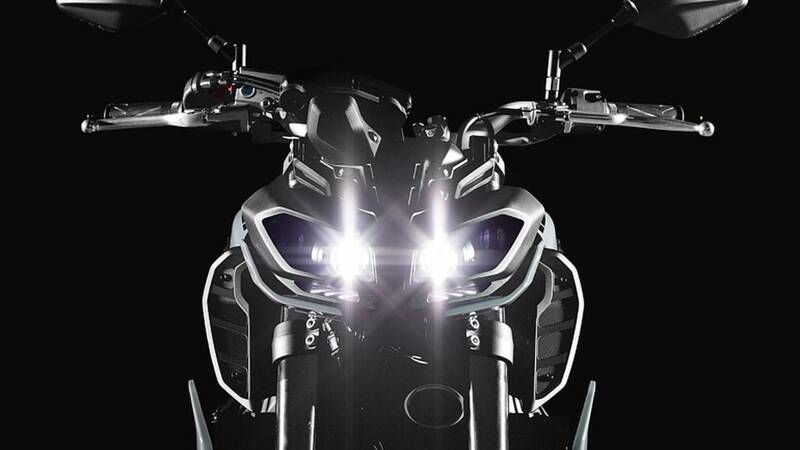 The lip at the front of the seat is also tapered up to keep the rider more firmly positioned in the saddle. The aluminum handlebar carries over and we love its forward, lead with the fist stance that manages to be both sporty and comfortable. Rev up the engine and let that 12-valve Triple sing. The music that comes out of it’s under belly muffler is music to the ears sounding similar to Valentino Rossi’s YZR-M1 sans one cylinder. Equally as impressive is the engine’s smooth running and lack of annoying engine vibration which adds to the riding experience. With its more narrow mid-section, it’s an easy choice for street riding. Critics will likely point out that the 2017 FZ is 11-pounds heavier due in part to the addition of always-on ABS, yet on the road we couldn’t feel the extra weight. What we did notice is the vastly improved action of the KYB-sourced fork. Where the original FZ-09’s front suspension was under damped for any semblance of sport riding, this updated setup, with 83% more compression damping is ready for action. 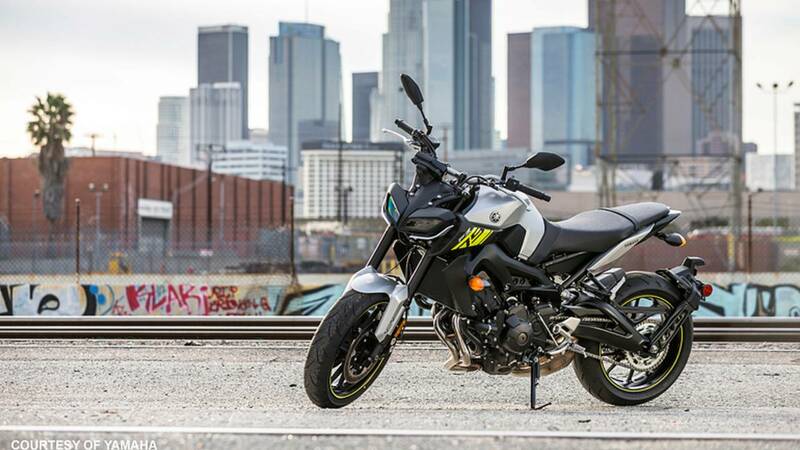 Yet there is no penalty in terms of agility, with the FZ-09 initiating turns with minimal bar input. 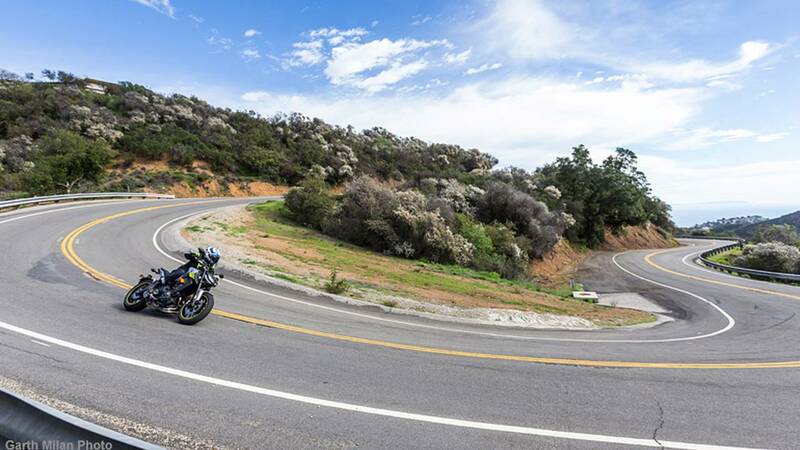 Although the engine size classifies it as a plus-sized middleweight, it feels anything but on the road, carving arches with the kind of nimbleness of its Parallel-Twin powered FZ-07 brother. Another plus is that compression damping adjustability was added complementing the existing rebound and spring preload adjustments. 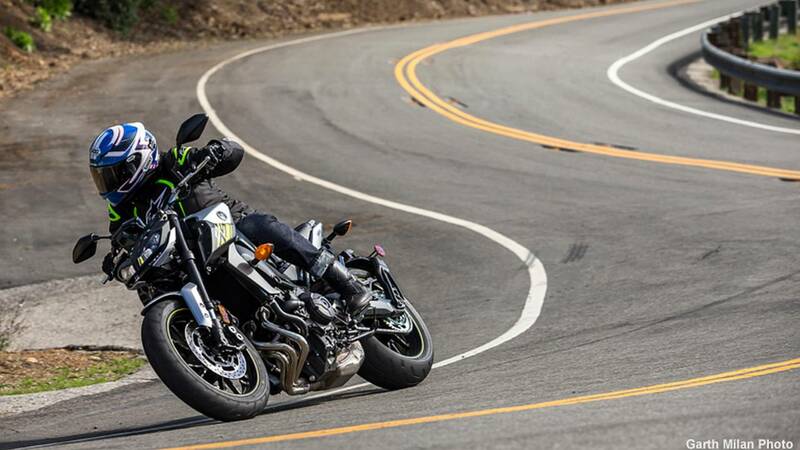 The FZ-09 comes fitted with either Bridgestone Battlax S20 tires or Dunlop Sportmax D214 rubber. 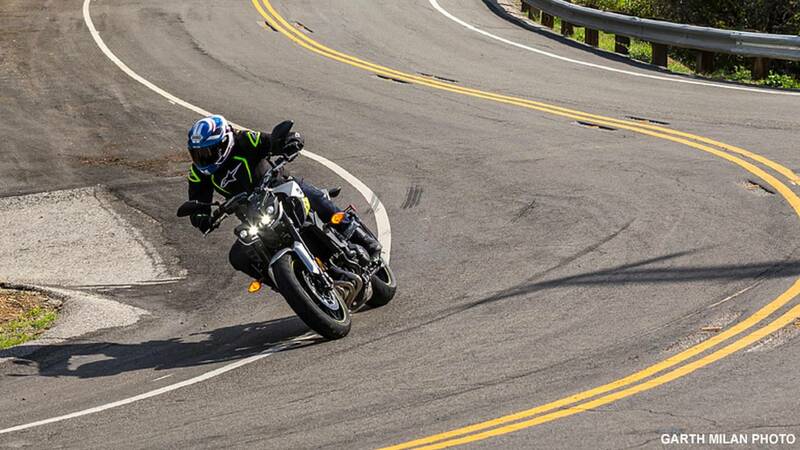 Our test bike was shoed with Bridgestone’s premium rubber and we’re glad it was as the S20 is one of our favorite all-around tires for general riding with a sport twist. Like before the triple disc brake setup is effective at shedding speed and the addition of ABS mitigates the chance of either tire skidding if you grab too much lever. In the aesthetics department, we adore the enhanced FZ Triple’s appearance with its bright quad LED head beams, and skinnier YZF-R6 inspired tail section that also houses a bold LED. Another excellent touch is the removal of the bulky rear fender/license plate holder, with it relocated to a more covert setup that attaches to the left side of the swingarm. It’s good to see Yamaha paying attention to subtle details giving its machinery more of a cutting edge and European touch and feel. 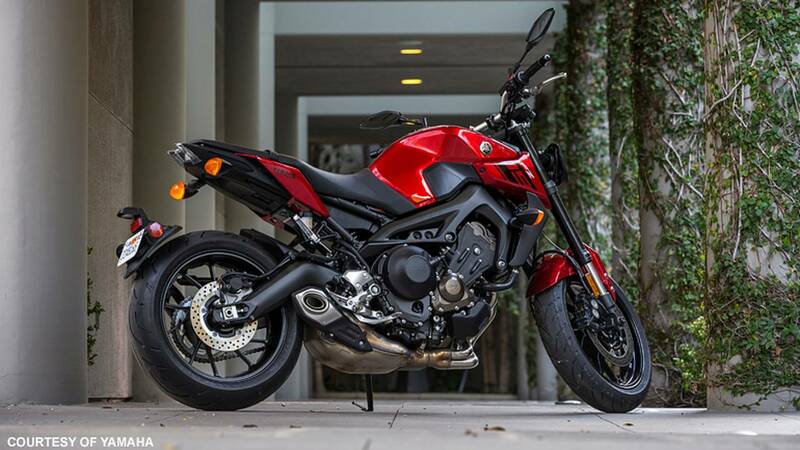 From the moment Yamaha’s FZ-09 rolled into the showroom it was one of our favorites. 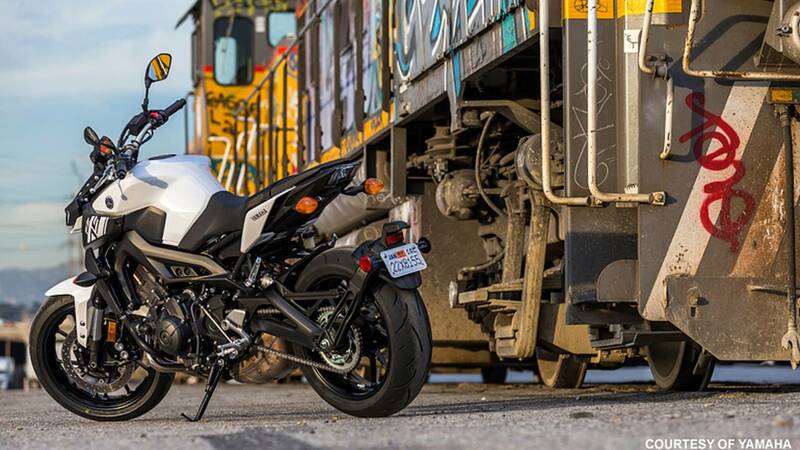 And with the Tuning Fork brand remedying each and every customer complaint, as well as improving comfort, safety and styling, Yamaha solidifies its dominance in the middleweight naked bike class. If you’re looking for a fun, zippy bike to rail around the streets, you should pay attention to this FZ. Body Type: Lanky in every sense of the word.